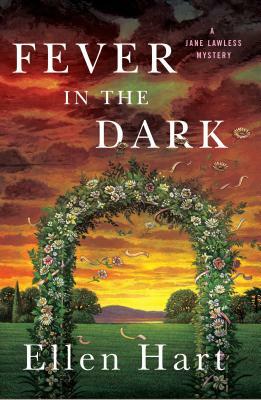 In FEVER IN THE DARK by MWA Edgars Grand Master Ellen Hart, Fiona and Annie return home from their one year anniversary trip to discover that their poignant proposal video has been posted on YouTube and has garnered hundreds of thousands of hits. The video is on the verge of going viral, and there’s enormous media interest in Fiona and Annie, as their fame comes just on the heels of the Supreme Court’s decision to legalize gay marriage across the country. As some of the attention starts to turn vicious, Fiona pulls in an old friend, private investigator Jane Lawless, to help separate the harmless threats from the potentially harmful. As the media storm continues to grow, Fiona revels in the attention, but Annie is furious. Fiona has always known that Annie has secrets, but her newfound notoriety threatens to bring Annie's past straight to their door. And then, when a murder occurs and Annie and Fiona are both suspects, it’s up to Jane to prove their innocence…although the more she learns, the more she starts to wonder whether they actually are innocent. Ellen Hart will once again captivate readers with her trademark smart, clever, mystery plotting and rich, human characters.